Church street bus station in Edgartown sill soon see some changes as VTA buses convert to electric. 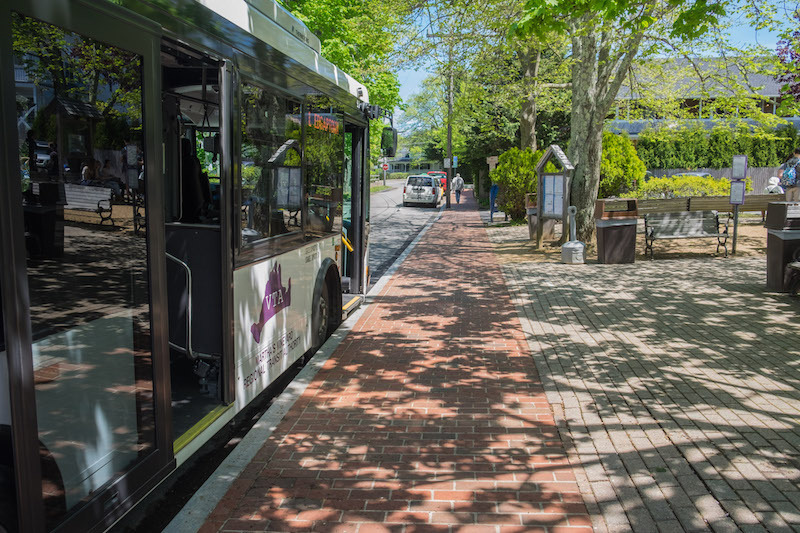 Changes are in the works for the Church street bus station area in Edgartown as the Vineyard Transit Authority prepares for the arrival of electric buses. Six electric buses are scheduled to join the bus fleet in June, VTA administrator Angela Grant told the selectmen this week. The transit authority is now looking to the next phase of the project, which includes installing bus recharging infrastructure at the VTA bus stop on Church street. Ms Grant said that stop is the second busiest on the Island. The VTA plans to install inductive recharging pads that the buses would drive over, she said. Other plans include removing four utility poles on Church street and moving the wires underground, and cleaning up the front of the visitor center to make it more attractive and accessible. Further plans include installing solar panels on the roof of the visitor center within two years or so. Ms. Grant said some funding has been secured for the overall project and she will have a clearer idea about the budget in June. With these projects in the works, Ms. Grant proposed creating a committee of town officials and nearby property owners. “There would be changes, so we want to get as many people involved in the front end,” she said. Selectmen suggested that Ms. Grant work with town administrator Pamela Dolby to assemble the committee. Ms. Grant said the town will also soon see positive effects from the switch to electric. One of the buses scheduled for arrival in June will be deployed to the Edgartown park and ride, she said, and the smaller bus will be much quieter. In other business, selectmen agreed to appoint planning board alternate James Cisek as board chairman until the April town election. Mr. Cisek will serve the remaining term for Robert Cavallo, who died in January. Scott Morgan was appointed to temporarily serve as the alternate. The Right Fork Diner will continue to operate at the Katama Airfield, after selectmen affirmed the airfield commission’s earlier vote to award the lease to Jamie Langley, who has operated the diner at the airport for years. Ms. Langley was the only bidder to apply to run the restaurant. Selectmen have scheduled a special meeting Friday to approve special and town meeting warrants. An executive session discussion about the Yellow House is also on the agenda. I'm not sure that is true. Here in Edgartown during the summer there are thirty buses an hour that go past my Main Street home; 15 inbound and 15 outbound. We have w. tisbury, ob, vh, south beach, and downtown routes all converging on tiny Church St. I don't believe for a minute that every single bus needs to go all the way into down town. For starters, some of the OB and VH line can end at the Triangle and give people the option to walk (would improve business at that end of town, too, by getting people out of the vehicles). I applaud the fact that the buses will hopefully be quieter (they currently make my neighborhood sound like a combination of Logan Airport and the NJ Turnpike), but somebody needs to do SOMETHING about the speed of the buses (and most vehicles). Where State Rd. meets Upper Main, at the jail, becomes 20mph residential zone, but vehicles are barrelling into town (and out of, off the stop sign at Pease's Point Way) at 35, 40, 45 mph, and this little two block section is teeming with families and children and bicycles during the summer. I have a good view of the goings on here and I see people fall off the sidewalk, or totter off on their bicycles into the street on a regular basis. This is a dangerous situation that I and my neighbors have been concerned about for some time. So yes, good that the buses will be quieter - now maybe I'll be able to have a conversation on my front porch - but for God's sake, SLOW DOWN! And could we please have a speed limit sign or two and a maybe little police presence?